Dozens of Quebec separatists have travelled to Scotland to witness its historic independence referendum on Thursday and see what they can learn from the spectacular advance of its "Yes" campaign. 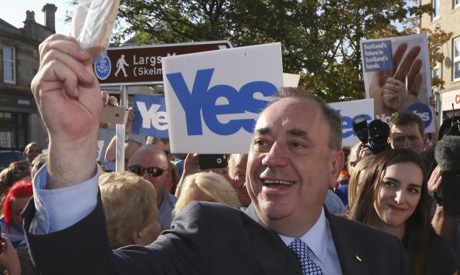 The Scottish National Party led by First Minister Alex Salmond climbed from a fringe force to taking majority in the Edinburgh parliament and is now within reach of full autonomy. Until recent weeks, few believed the "Yes" campaign had a real chance of winning but the opinion polls indicate that as Scots cast their votes on Thursday it was only narrowly behind the "No". Quebec separatists' bid for independence was narrowly defeated in 1995, and the predominantly French-speaking Canadian province's aspirations to nationhood has links to fellow Commonwealth region Scotland. In the 1970s, Quebec independence leader Rene Levesque travelled to Scotland to share know-how from his campaign, which led to the first referendum in 1980. But after two failed votes, a bitter defeat for the separatist Parti Quebecois (PQ) in elections in April this year and a leadership race in the coming months, Quebec separatists have returned to Scotland not to give lessons, but to learn. Fifty young people from Quebec have rented two houses in the centre of Edinburgh, from where they have got involved with events and host local speakers. "The aim is to understand the campaign strategies," said Francois Roberge, organiser of the Scottish pilgrimage, which is called "Get your kilt, let's go!" The young activists were struck by the "decentralisation" of the "Yes" campaign, in which groups of immigrants, women, farmers and myriad other local organisations spread the word without waiting for orders from political leaders. They were also interested that the campaign had relied on arguments about best governance, rather than on notions of national identity. The Quebec separatist movement struggled after getting bogged down in a long debate over a controversial "Charter of Values", and the many young people who question the need to create a new state in the globalised world. "Today, Quebecers have no doubts that Quebec has the ability to be independent, but they no longer want to hear about it," said Genevieve Harvey, 25, a campaigner from Montreal who works as an occupational therapist. Still smarting after the crushing electoral defeat in April, the example opf Scotland shows that "in 2014 it is still possible, it is not too late to talk about the independence of a country," Harvey said. Scotland is a chance for the delegation, which includes Quebec intellectuals and three PQ deputies, to take notes on how to galvanise minorities and employers, the groups most opposed to independence in the past.